This year, in the interest of fitting as many David Bowie tributes, Hamilton tutorials, and seemingly confirmed Lauryn Hill comebacks as possible into tonight’s Grammys telecast, the National Academy of Recording Arts and Sciences has wisely chosen to give away the majority of its awards during a pre-telecast ceremony this afternoon, leaving less than 10 Grammys to be awarded during the big show itself. That pre-telecast ceremony is being live streamed from Los Angeles as we speak; so far, most of the awards have been for packaging, archival releases, New Age, jazz, and world music albums, and all the other awards generally given out to musicians not famous enough to appear in Us Weekly. (Louis CK didn’t show up to accept his, we’re assuming because he’s busy filming Horace And Pete. Taylor Swift, who also didn’t show, was presumably busy getting ready for tonight’s show.) A full list of winners is currently taking shape at Variety, and we’ll post the highlights below as they’re awarded, with another update later tonight after the telecast. Update, 5:41 PM CT: That’s all for the “Premiere Ceremony,” a.k.a. 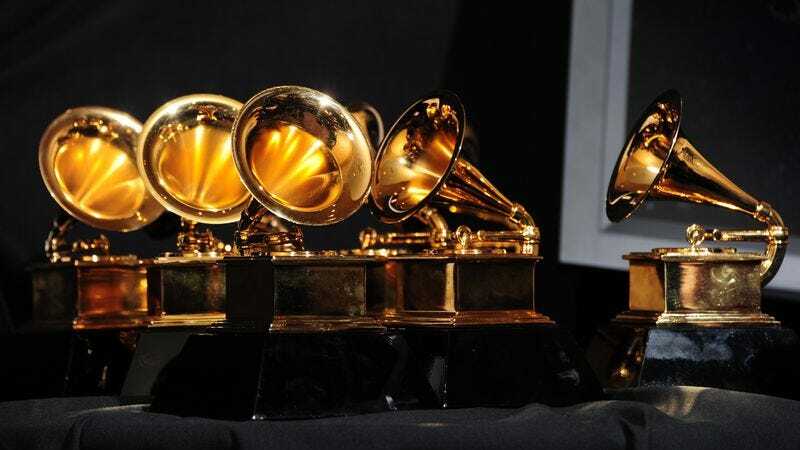 the Proletariat Grammys. Trophies were handed out, many of the winners failed to show up to collect their awards—except for Ghost, which showed up in matching devil masks—the presenters asked those in attendance to move up and fill the empty seats in the front row twice, and now everyone is going across the street to take their seats for the Grammys telecast and gawk at the celebrities. We’ll update you with the rest later tonight.